"The first time I met Dr. Tim George, I brought my 1 ½ year old son to see him for fluid in the ears. Several doctors told me the only way to clear the fluid in his ears was to have tubes put in. As a last ditch effort before surgery, we saw Dr. George. A family friend, who works in the medical community, suggested Dr. George to us. Dr. George assessed the situation and told us what our options were. What I appreciated about our first meeting was that we were never pressured to do what he recommended. Dr. George treated our son several times a week for a couple of weeks and within a month, the fluid in Robert's ears was cleared-with no surgery! My family has seen Dr. George for a wide variety of issues. From my oldest needing an adjustment from playing his violin too much to me needing an adjustment from joys of third semester pregnancy, Tim George has aided in our family's health. I recommend Dr. George to all of my family friends and they, too, have benefited from his expertise." "Uncertain of whom to go to after a fall I took, I now know I chose the best. Dr. Tim is professional, knowledgeable, listens and really cares. I can't begin to thank him enough for all the good he has done. I am so grateful and blessed. When there is something this good, it's meant to be shared. I highly recommend Dr. Tim." 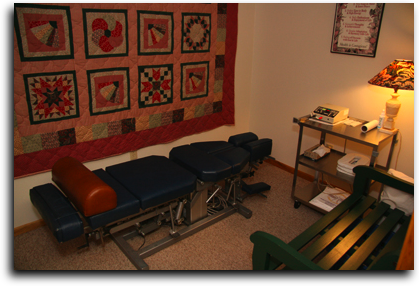 "I have been receiving chiropractic care for more than 20 years. For the past two years I have had severe tendonitis (tennis elbow) and some neck pain. The medical recommendation included neck surgery and physical therapy as well as cortisone injections for my elbow. The cortisone and physical therapy provided temporary relief but I was unable to resume an active lifestyle. The prognosis for my age (46) was that I would likely have tendonitis for the 'rest of life'. Dr. George believed otherwise. He gave me hope that my condition could be successfully treated with chiropractic care and full recovery was not only possible but likely. The pain relief I have experienced from Dr. George's therapy has helped me return to my normal routines. Two months ago I could not grip and swing a golf club without severe pain. At the time of this writing I am golfing with only some stiffness- the pain is gone. I can also rake leaves, throw a baseball, and most importantly, engage in physical activities with my children. These are things I could rarely do over the past two years but now can because 'every little movement' no longer causes pain in my elbow. As a result of Dr. George's care, my quality of life has dramatically improved. His chiropractic care has also relieved much of my neck pain. I must also mention the friendly 'in home care' Dr. George and his staff provide at his clinic. In the day of big box chiropractic offices that left me feeling less of a person and more of a commodity, Dr. George and his staff provide personal and caring approach supportive of full recovery."